Not all of us are wired to feel safe and supported. Childhood abuse, abandonment and trauma can wire a person to live on the edge of a more or less permanent fight or flight response. On an energetic level, this relates to the development of the root chakra which helps us stay grounded and to sleep restfully. A weak root chakra means a weakened immune system because of constantly being on high alert with the adrenal glands in perpetual overdrive – even when we should be resting or sleeping. The Tarot spread below looks at how we can begin to feel safe and supported. It takes into account the spiritual, mental, emotional and physical aspects of support. It is not meant to replace advice from a therapist or medical professional but can be used to help you create more support for yourself on every level of your being. 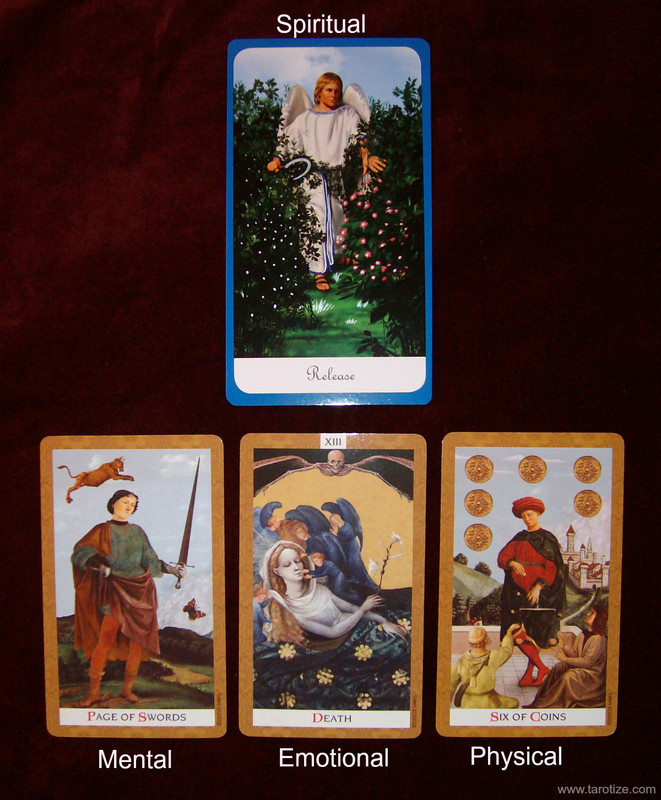 I chose to work with the Golden Tarot and the Guardian Angel Oracle for this reading. What immediately strikes me here is that in order to make myself feel more supported, I must first be willing to release the old. I get a feeling of clinging to old stuff like a child would cling to a much beloved teddy for safety. The card which signifies how I can support myself mentally dovetails beautifully with the flying ox. The ox is a symbol for stubbornness and the Page of Swords is a sign of a flexible and curious mind. I.e. in order to help myself feel more supported mentally, I need to allow for new mental input and let go of old outdated modes of thinking. This could refer both to negative looping thoughts and to thought habits that used to keep me safe. Quite possibly, the stubborn looping thoughts in my mind could do with taking a flying hike to gain a bird’s-eye perspective of what is really going on! Thought transformation is also indicated by the butterfly in the Page of Swords image – Out with the old, in with the new! Affirmation: I allow playful curiousity guide me to new and better ways of thinking about life and my place in it. I let go of old thoughts and habits with ease. On the other side of the Death card we have the 6 of Coins (Pentacles). Moon in Taurus people do not willingly embrace change. On the physical level, I believe that it would be beneficial for me to keep some of the routines I have. Going to bed at a certain time and rising early to do my morning yoga is not something I have to give up in the name of change or transformation. On the contrary, these sort of routines help keep me grounded. May you be blessed with the certainty that your Guardian Angel has your back!